When planes can fly I will be able to see the curvature of the earth. Fascism comes after socialism and accompanies communism. Fascism is a bit premature as progressives have not yet turned an entire generation against the previous one. Wait until the millennials reproduce and their offspring are out in the world. Fascism is going to be alive and well at that point for the reason there will be none left from the 20th century with any sense. It will be a progressive mess of dumbed down people and newspeak. Look for fascists to step up their game at that time. No one will care as they will have no reason. The economy will be absent or fully socialist - I choose the later. There will be no two party system as there will simply be government. People need to read the book "1984" and realize how well Orwell outlined our future when he wrote it back in the mid 1940s. One of the scary aspects is the supposition that it is possible to destroy humanity without destroying humankind. What is to come later is scarier. Correction for the NON-reader. I posted EDUCATORS...see, that isn't "educatION"...can you see the difference in those big giant words??? Reading history will be tough but if you do you will find that Fascists attacked educaTORS.. DUH! JUST LIKE THE REPUBLICANS AND TEABAGGERS DO! """fascist were pro-union...they were against private unions ""
LOL! Make up your mind! Facists, just like Republicans and Teabaggers, hate unions because they give the average working AMERICAN power....Fascists, just like REPUBLICANS and Teabaggers, do NOT want the average American to have power or wealth because you can't dominate a country where average citizens have power. Fascists were AGAINST abortion just like Republicans and Teabaggers because it is a form of CONTROL. """and yes symbolism...like "hope and change" and "yes we can"
Sorry, but lack of knowledge of history and facts doesn't make your misguided argument that Liberals are fascists...the Repugs are PROUD of their similarities. You are rabid about projecting your version concerning rep/TP, aren't you? Progressives are the true fascists and they have yet to flex their muscles. When the government imposes martial law and the corporate police beat us down into submission we will realize fascism. Josef Mengele's quote “The more we do to you, the less you seem to believe we are doing it" will be more true in 20 years than it is now and that will be hard to top. Yep, I said 20 years as progressives - the UN - haven't disarmed us or declared martial law yet. Wait until your grandchildren are grown, they will be in peril. NAZI Gerrmany didn't unfold overnight, did it? The followers of the democratic party are slowly becoming socialist communists. Problem is some know it and some don't even know it. There's this obnoxious practice many people have of throwing out the term "fascist" to define any political belief with which they disagree. Just as with "Marxist" or "socialist", those using the term often have no idea what the word actually means. One could point to any American administration in the last fifty years and find some elements of fascism, and I wouldn't disagree with anyone who argues that the last two presidents are among the worst offenders. Stretching a definition here and there is something most of us are guilty of, but fascism has absolutely no connection to socialism--other than the the fact that the ideologies are pointedly adversarial to one another. The fact that German fascists called themselves "National Socialists" doesn't mean that NAZI Germany was socialist. If you believe it was, then you probably also believe that The Democratic People's Republic of Korea is a democracy. Looking at the three prominent fascist societies in Twentieth Century Europe, and the numerous South American post-WWII imitators, there are several common traits which align fascism with authoritarian right wing capitalism. Fascism demands a level of patriotism which often becomes jingoistic. In The US; socialists, liberals, Democrats, progressives,etc. ; are routinely accused of not being patriotic enough. Fascism requires a close connection with organized religion. Those defined as "the left" in the US are more likely to be ambivalent, or even antagonistic, to organized religion. Fascism cannot be separated from hyper-capitalism. The state and the military require the presence of lucrative corporate ventures in order to serve their needs. This means allowing those corporations to reap in enormous profits. For example, IG Farben in NAZI Germany. Any real form of socialism is diametrically opposed to this kind of corporatism. Even liberal capitalists seek at least some mitigation of corporate excess. Fascism demands an emphasis on conformity to traditional social norms. That's why it's so inhospitable to those who violate those norms--homosexuals, feminists, atheists, etc. The political left tends to be highly-supportive of those who hold non-traditional beliefs. When fascist societies form; it is socialists, communists, and labor activists who are first eliminated or imprisoned, since they represent agendas which are antithetical to fascist protocol. Tyranny can form from any kind of economic structure. Fascism, specifically, is inherently related to capitalism and right wing authoritarianism. Fascism, specifically, is inherently related to capitalism and right wing authoritarianism. How do you mince and mash "right wing" and "authoritarianism" together? What part of individualism and limited government is so hard to understand? There's only one group of people who think the State is omnipotent and should be omnipresent and it certainly isn't "right wing" anything. Moving from the left to the right you go from a completely controlled society ran by the heavy hand of government to a society free from government. In other words you go from one extreme, socialism, to the other extreme, communism. The left loves to ignore reality when they move goal posts. I understand their desire though to try to put as much space between them and authoritarian state-run regimes like NAZI Germany or Fascist Italy. 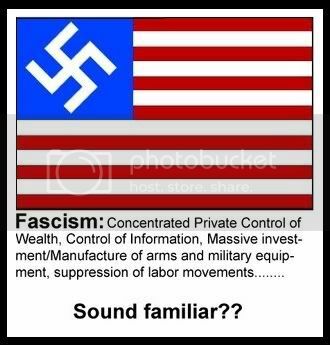 Fascism comes from the root word fasces which has a symbol of wooden rods tied together with a red strap (the people) with a protruding axe head (the state). And to the extent that you might be correct in some of your assessment there is a reason why Fascism only found roots in homogeneous states. It needed common themes to garner support for and against uniting "the people" (like in NAZI Germany with the Jews or National/Ethnic pride like in Italy) and it needs (at least the Fascist regimes that plague or history) perpetual war. "The Fascist State organizes the nation, but leaves a sufficient margin of liberty to the individual; the latter is deprived of all useless and possibly harmful freedom, but retains what is essential; the deciding power in this question cannot be the individual, but the State alone"
When fascist societies form; it is socialists, communists, and labor activists who are first eliminated or imprisoned, since they represent agendas which are antithetical to fascist protocol. Socialist - These people believe in a classless society which is the exact opposite of humanity. Communist- These people believe the state shouldn't exist. Labor Activist - You made that up -- but to the extent that Fascism might oppose those people -- it would be because they take power away from the State. Fascism is all about the State being all powerful and omnipotent leaving only enough room for the individual to not rebel. In other words Fascism is Socialism (State controlling the means of production -- not the Marxian Socialism that's gets lumped in with it) with a capitalist veneer. Holy crap! At least 12 of them are already a done deal.